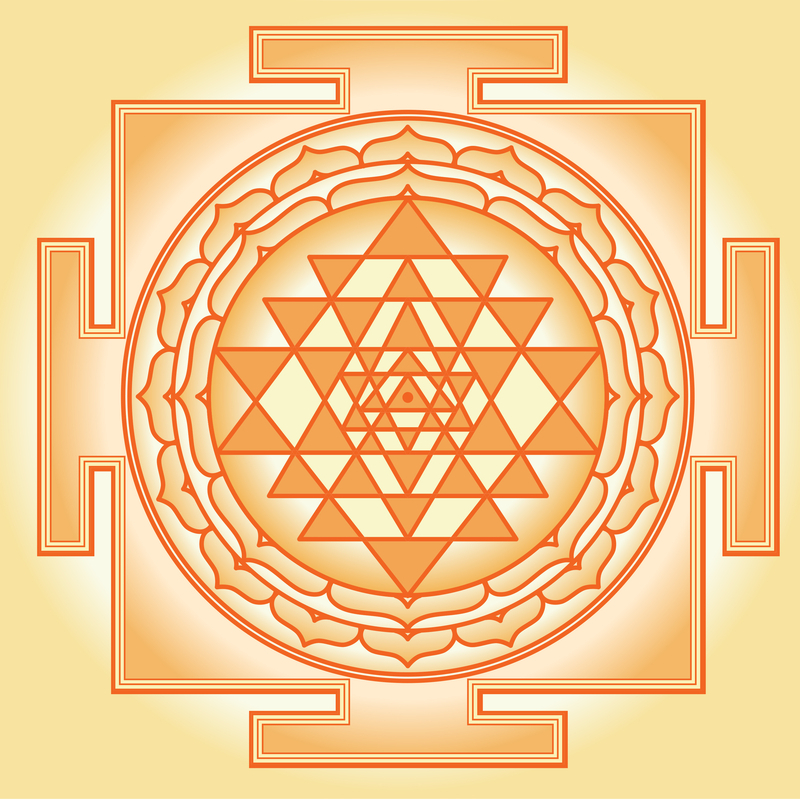 The Sri Yantra mandala hails from Hindu tantric practice, and is one of the most recognizable forms of mandala. These always take the same geometric form, and are representative of the beautiful goddess Lalita and the union of the divine with the earthly realm. The Hindu religion contains many different variations of practice, and Sri Vidya contains elements of tantra, or the pathway to understanding the self as a whole. Dedicated to Lalita as goddess, Sri Vidya is focused on ways of uniting the self. The basic beliefs stem from the dualities that exist in the world and within ourselves; for example, the body and mind duality which, when at odds, can lead to a loss of equilibrium of self. Therefore, in order to reach an enlightened state of being, one must reconcile these dualities and accept their unity as a pathway to actualizing the self. In doing so, the self becomes whole, which in turn allows the self to function within the energies of the universe. In the Hindu religion, the Sri Yantra is representative of a system that controls the universe, and the creative and divine forces within. The actual shape and components are meant to draw the eye outward and inward from the center, with each layer adding a different dimension to the experience of viewing. Overall, they represent the steps to integration of a whole self with a whole external world. There are 43 triangles in a Sri Yantra, with each representing a different step on the path to self. These mandalas have individual elements that contribute to the overall geometric pattern that forms, and each represents a component of the world’s energy. The bindu is the central point, from which all other shapes emerge, and represents the union of all beings and energy; here, the divine is unified with the physical universe. This is both the start of creation and the ultimate goal of being one with the universe. Male and female energies are represented by the triangles surrounding the bindu; male is represented by triangles with facing up, while those facing down represent female. Every actualized self has reconciled male and female aspects. Surrounding the triangles is a series of three circles that create a rhythm of endless time; there is no beginning or end to the self’s place in the universe. Lotus petals surround the circles in two larger rings, and these represent elements of opening the heart, literally unfolding the core part of the self, allowing for full unity between physical and mental. These mandalas have been used for centuries as a component of tantric meditation practice. The geometric unity within the pieces reflects the unity of the individual with the surrounding universe, and this pattern of repetition has long been shown to help balance the mind. In meditation each step of the mandala is considered, and the self is encouraged to recognize the process of merging with surrounding energies. 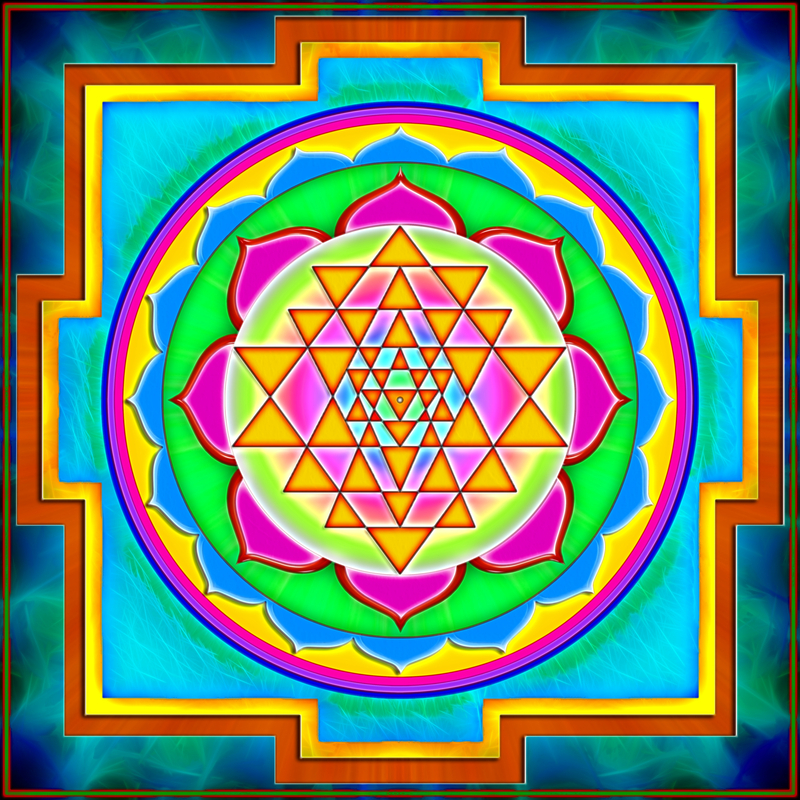 However, the Sri Yantra can also have meaning in therapeutic practice, as a way to help individuals consider the geometric patterns that underlie everyday life, and as a symbolic path to understanding the elements that make a person whole.